New Government jobs opportunity for ITI pass candidates under various trades. 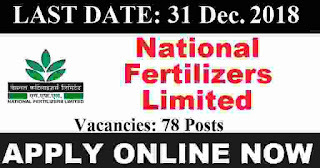 National Fertilizer Limited of India is looking to recruit ITI pass candidates under various trades as an Apprentices. So those who are looking for the Government jobs after passing out their ITI classes can apply for this NFL Recruitment process 2019. An official notification related to these ITI jobs has been published by NFL Recruitment department on their official website. We share this information on the basis of that PDF file only. Under IMPORTANT LINK section we shared the official Advertisement Link as well as the link to apply online for these ITI pass Government jobs in India. So before moving to that section please read the article carefully. We explained each and every prospective related to this NFL Recruitment process in this article. Pay Band: As per Apprentices Rule 1961. In the table below we are going to share two major eligibility factor related to this NFL Recruitment process 2019. One factor is the Educational Criteria and another one is the Age limit. Those who satisfied these criteria can apply for these ITI pass Government jobs in India. Check the table below for more information. Indian fresher candidates who have passed in their 10th class examination from a well-recognized education board of India. After completing school education must have completed 2 years ITI course in relevant Trades which we explained in the above table. Great news to all ITI pass candidates that they can apply for this NFL recruitment 2019 without paying the application fee. ZERO application fee is required for applying this NFL Recruitment 2019.